If you are a SAM PuttLab or SAM BalanceLab owner and want to be added to this SAM Locations listing, please send an email to info@scienceandmotion.com. SAM sales and daily rentals. Putter fittings and putting analysis. Please click here to see an overview about our services . 510 S Country Club Rd. If you are a SAM PuttLab or SAM BalanceLab user and want to be added to this listing, please send an email to info@scienceandmotion.com. This location is equipped with SAM PuttLab and SAM BalanceLab. The Ole Pedersen Golf School works together with Golf Chateau de Preisch in Luxembourg, and is part of the ESTESS family. Golf Chateau de Preisch is the best golf course in the region and offers 27 holes, 6 holes compact, 18 covered boxes on the range, 2 putting greens and pitching facilities. The friendly atmosphere and the super condition of the course is the reason why we recommend Preisch. Christian Müller / GC Ingolstadt e.V. GOLF CLUB HUBBELRATH, Land und Golf Club Düsseldorf e.V. 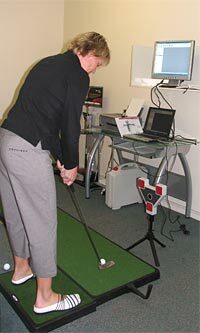 Dynamic putter fitting with SAM PuttLab. Brendan McDaid’s Golf Academy offers top class individual lessons and one of Ireland’s leading golf day schools where golfers are thought to bring their game to a new level with Brendan’s excellent teaching, experience, feedback and latest teaching technology and training aids, including the SAM putting software, Astar Video Analysis software, Golf Explanar, Force platforms, impact bags and many more. This unique academy is tailored to suit all golfers from those looking to move their handicap from the twenties to the teens and those looking to break the pro tour and each golfer can receive an individual fitness program from the Academy’s resident physiologist and fitness instructor as well as receiving advice from the Academy’s resident sport psychologist. SAM software takes this academy to a new level. Come and experience it for yourself. Polos is also the official distributor for Science&Motion Sports in Italy. you with sales and repairs. Book your SAM PuttLab lesson now! PUTT LIKE THE TOUR PROS! Golf Inspirations is using the Science & Motion (SAM) PuttLab at Kingsfield Golf Range with all golfers, single or in groups, regardless of age, gender or skill level. Working in association with Zen Oracle and the XtendAlign alignment system, the SAM PuttLab’s superbly detailed analysis will help improve your putting stroke and statistics. Already used extensively on the European Tour you should take advantage of this outstanding putting analysis system, to help you achieve better scores and handicap status. Call or email me now for details on how I can help you take a path to better putting. the academy provides a comprehensive service, including SAM PuttLab. of programmes and prices or contact us to make a booking or enquiry. Click here to see a video of Steve North, Director of Instruction, explaining how the SAM PuttLab works. We as Golfers Paradise are using the SAM PuttLab Fitting Edition to support our customers during the putter purchase inside our shops. Every shop has around 300 putter models available from different manufacturers as Maruman, Radius, Honma, Nicklaus, Odyssey, Ping, and many more. Test the latest putter models at Golfers Paradise with SAM PuttLab. Our SAM educated shop staff will recommend the best putter for your putting skills to improve your short game. If you are a SAM PuttLab or SAM BalanceLab user and want to get information on how to become a SAM CERTIFIED INSTRUCTOR, please send an email to info@scienceandmotion.com.